I’ve just finished reading “The Little Black Book of style” by Nina Garcia. She is the fashion director at Elle Magazine and involved with “Project Runway”, a cable TV show that I’ve heard is addicting. The book is full of some very good suggestions. I particularly like the idea of investing in quality basics and adding pops of colour with accessories. Buying timeless classics that nonetheless add dramatic impact — a leopard print coat, or crocodile handbag, for example — is good investment advice. Almost none of it is applicable to menswear, of course. Our trends are trends of millimeters. Narrower trousers, fewer pleats, no pleats was the progression. Narrower lapels. Not skinny, just narrower. And so narrower ties soon followed. Now the classic tie width of the 50’s through the 70’s is back in fashion to reflect the narrower lapel. But it is very easy to get caught up in fashion and not even realize it’s happening to you. Take my picture above. It is a look based on a street scene in Milan during the menswear shows. I saw the shot on The Sartorialist and thought “Hey! 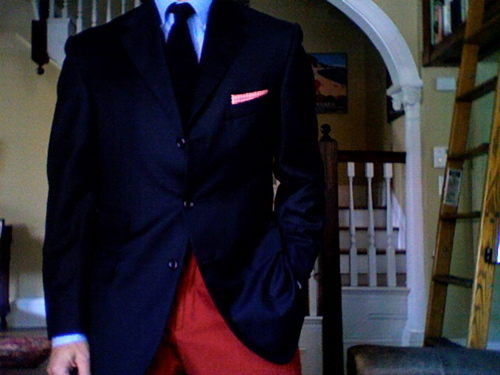 I’ve got some red trousers and they would really pop with a blazer,” etc. .
Now, I am all for living in the present. Anything else is simply a frustrating waste of time. We are here and now and must accept certain things with good grace. Men don’t dress as they used to. Well, most men, anyway. But what we don’t have to do is compromise our principles, ever. And if one of those principles is to dress well while cultivating an everyday elegance, well ask yourself…. WWCGD? What would Cary Grant do? “I’m sticking with the classics, and if somebody doesn’t like it, I can deal. If you look at Cary Grant’s suits from the thirties, forties and fifties, they still look good today. That’s style, not fashion.” Glenn O’Brien, The Style Guy, quoted in “Cary Grant Style” by Richard Torregrossa. Cary Grant, once he became Cary Grant, knew what looked good on him and wore it even on days when he wasn’t in the public eye. Cary Grant made sure that he was always “Cary Grant.” He made the effort to always look the part. Of course, he loved clothing. He had suits in storage that he had no room for in his (mechanized!) closets and dozens of pairs of nearly identical, highly polished bespoke shoes. But they all had one thing in common: sober colours. Dark suits to match his dark hair in the early days. Mid-grey as he greyed. Dark shoes. Cary Grant’s secret was this: elegance through constant editing. It’s a lesson we should all take to heart. 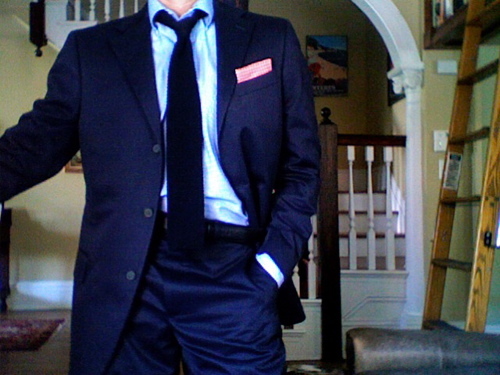 This entry was posted in Elegantology and tagged Cary Grant, clothing, fashion, Nina Garcia. Bookmark the permalink. I must admit I like the red trousers look, though it’s almost a bit 4th of July at the country club. Clever images by balancing the two cavalier looks by loosening the necktie and leaving the jacket unbottoned in the full suit versus the closed neck, buttoned jacket with the red trousers. Whew — glad you came to your senses. I think the Cary Grant question could work in a lot of circumstances and not just clothing. Athenaeus, it’s a younger look than I should be wearing in my advancing years. It could work well on someone else. Ms. Brazill, I’m thinking of something along those lines and am checking into something right now! Love it! Red trousers look good on a gent whatever his age, IMO. Will you yell at me if I tell you I like both looks? LBT, yours is an aesthetic I trust implicitly. By the way, Southwick on clearance at Sierra Trading Post… in the event… . Great stuff. Found you through A Continuous Lean. Thank you Oscar. ACL is doing some good wok over there! I’m just emerging from fashion week and stopped by to catch up on your blog. In this case, my vote goes for the dark trousers. But I can understand the attraction to the red pair, the color is so fun and appealing. I quite like both looks. I think the use of color should be limited to one, maybe two items. I like how in the first photo the top half is fairly subdued; dark suit jacket, (which to me is virtually neutral), a dark tie, subtly patterned shirt and a thin slice of pocket square. I think that balances well with the red trousers. I like the second photo as well. You pulled out the pocket square for a little brightness. Chris- I remembered this post and I’m stealing your photo (the top one) and copying this look. I hope you take that as a compliment! Paul, have at it! That’s what they’re here for.